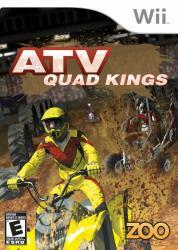 ATV Quad Kings immerses the player in the world of ATV motocross racing where aggressive driving and hard-hitting skills are needed to become the King of ATVs. Travel across the globe from the United States to Australia and race in nine breathtaking locations. Compete in incredible high-adrenaline races at each track� but that�s not all! Perform tricks and catch big air in freestyle events to increase your skill rating. There�s no where to hide! It�s fast and furious four-wheel racing on Wii!